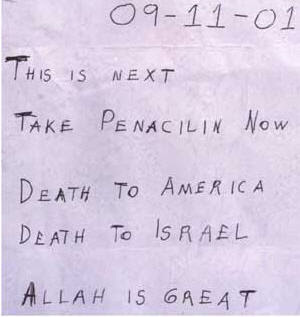 (42) Although the FBI now admits that the 2001 anthrax attacks were carried out by one or more U.S. government scientists, a senior FBI official says that the FBI was actually told to blame the Anthrax attacks on Al Qaeda by White House officials (remember what the anthrax letters looked like). Government officials also confirm that the white House tried to link the anthrax to Iraq as a justification for regime change in that country. (45) Undercover Israeli soldiers admitted in 2005 to throwing stones at other Israeli soldiers so they could blame it on Palestinians, as an excuse to crack down on peaceful protests by the Palestinians.